We are back for another spring sale just in time for Mother's Day! 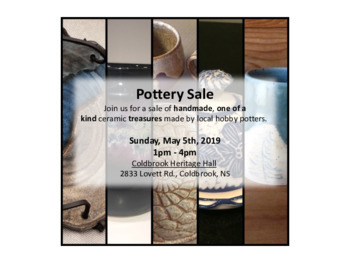 Join us for a sale of handmade, one of a kind ceramic treasures made by local hobby potters. There will be mugs, bowls, trays, vases, jewelry, and so much more for gifts, wedding gifts or something special for yourself! We are able to accept cash, VISA, and MasterCard at the sale. We can also accept debit up to $100 using Tap.